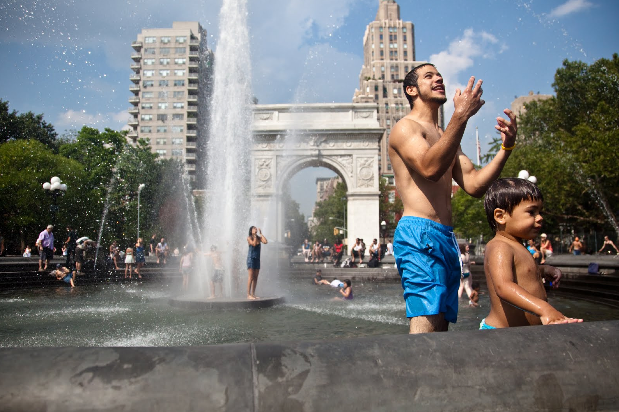 Above: People cooling off in Washington Square Park on a scorching summer day. A New York City high rise apartment building, which can be significantly hotter than outside temperatures. When you think of a heat wave in New York City, an extended period of really hot uncomfortable days might come to mind. However, heat waves are more than just uncomfortable, they can be deadly. They are associated with dehydration, heat rash, heat cramps, fainting, heat exhaustion, heat stroke, emergency room visits and death. In the United States, heat waves are the deadliest extreme weather event, killing on average more people than hurricanes, lightning, tornadoes, and floods. The eminent threat of climate change will only exacerbate this public health problem. As greenhouse gases continue to be spewed into the atmosphere and global temperatures increase, the intensity and number of heat waves will continue to increase along with it. Climate models predict that by the 2080s the number of heat waves per year will be triple that what it is today. This means hotter summers, more frequent heat waves, and the negative health outcomes that come along with them. During heatwaves the most vulnerable are the elderly, those living in poverty, and those with underlying health conditions, and often they don’t even know they are at risk. Social networks also play a critical role in the risk of heat waves. Those living in communities without strong community networks are at risk because they might not have a family member or neighbor to check up on them and ensure that they are doing okay during a heatwave. 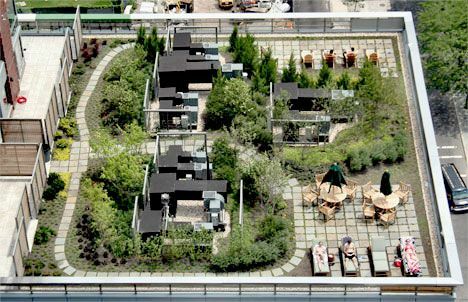 An apartment building in Battery Park City that incorporates a green roof and a rooftop park into it’s design. New York City is already considerably hotter than surrounding areas because of the urban heat island effect, which is attributed to the lack of vegetation and abundance of dark and impervious surfaces such as roofs, sidewalks, and roads. These surfaces efficiently absorb and trap solar radiation, rather than reflecting it back into the atmosphere, and cause warming of the air and surface temperature. This effect often makes buildings extremely hot, and as heat rises, the top floors in high-rise buildings can be as much as 15 degrees hotter than outside temperatures, as was seen in the Chicago 1995 heatwave. According to the Center for Disease Control, in NYC the home was where the majority of heat-related illnesses occurred that resulted in hospitalization and fatal cases. In these fatal cases, none of the deceased had access to a working air conditioner. This makes having access to air conditioners extremely important, which makes having electricity important, and in turn, electricity demand is highly sensitive to increases in temperature: during heat waves, the electrical grid can often near the maximum power availability due to high demand, and if overloaded, can lead to a blackout. In New York City people are at risk of dying because their homes are just too hot and people who have air conditioners are at risk if a blackout occurs. According to a study done by Urban Green Council, the amount of window area, amount of air that escapes through walls, and the amount of insulation in walls and roofs greatly influence temperatures during a blackout and should be considered in the construction of new buildings, as well as the renovation of older buildings. 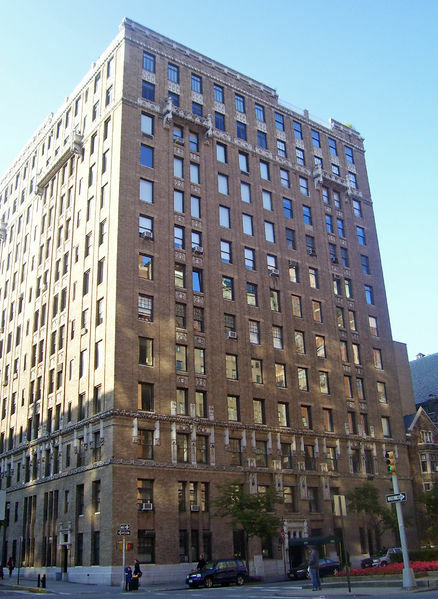 Buildings like these would not only be energy efficient but would also make a world of a difference in protecting us against extreme heat if a blackout should occur. In addition to energy efficient buildings, we can tackle part of the urban heat island effect by changing the way we design roofs. Roofs can be painted white to reflect solar radiation, or planted with vegetation which can remove heat from the air through evapo-transpiration; both would help to cool surrounding areas.